The movie will be preceded by an informal networking, with cakes and coffee. We will also proceed to draw the winner, among all members registered as of Thursday 26th, of a 7-night stay for 4 persons at Borgo di Vagli, in Tuscany. A filmmaker who has run out of inspiration has a new project thrust upon him by fate in this comedy from director Carlo Mazzacurati. Gianni Dubois (Silvio Orlando) was once one of Italy's most successful movie directors, but it has been five years since he last made a picture, and his producers are running out of patience as he tries to come up with a vehicle for starlet Flaminia (Cristiana Capotondi). Gianni visits his vacation home in Tuscany to brainstorm a story, but a mishap with the plumbing accidentally destroys a fresco in a church next door. The mayor (Stefania Sandrelli) is outraged, and comes up with a suitable punishment for Gianni -- it is five days to Good Friday, and the church needs a director for their play on the life of Christ. Gianni agrees, but soon falls into a deep depression, and his new assistant Ramiro (Giuseppe Battiston), a friendly reformed criminal, steps in to help. But neither Gianni or Ramiro are sure what to make of the cast assembled for the project, especially Abbruscati (Corrado Guzzanti), the local weather forecaster who as volunteered to play Jesus. 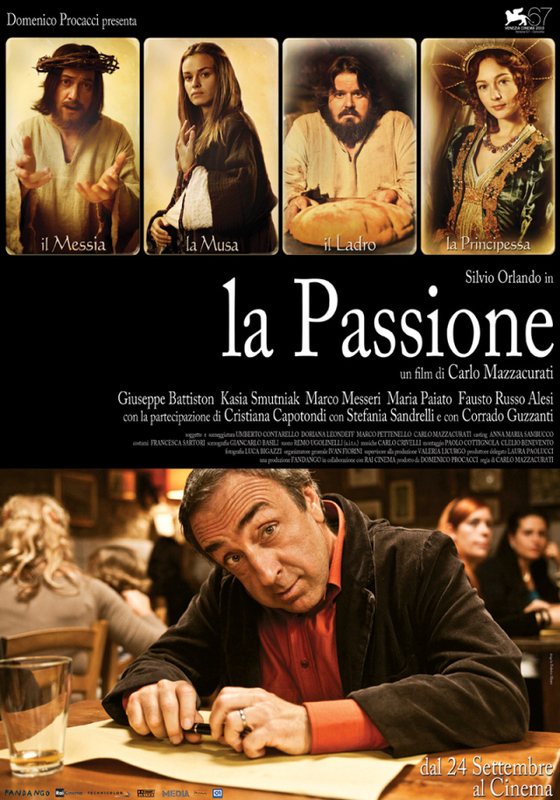 La Passione (aka The Passion) was an official selection at the 2010 Venice Film Festival.